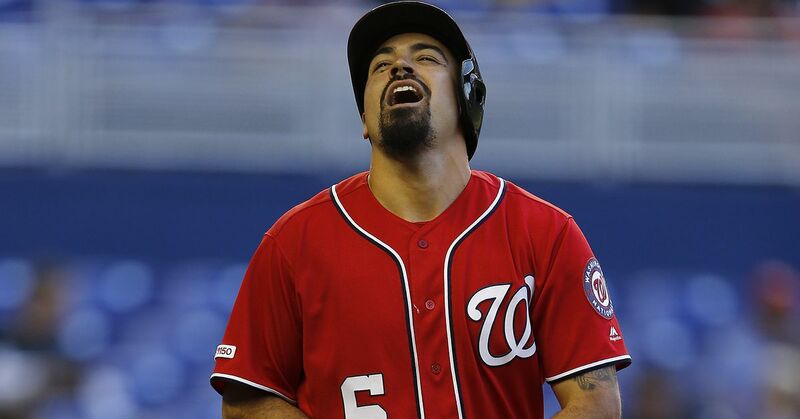 The Washington Nationals have had at least two of their best players claimed on waivers by other teams. Per Chelsea Janes and Jorge Castillo of the Washington Post, Bryce Harper, Daniel Murphy and Matt Adams were claimed on waivers. Jon Heyman of FanCred reported the 48-hour deadline to work out a deal for Harper has passed, so he will finish out the season with the Nationals. MLB Network Radio's Grant Paulsen reported the Los Angeles Dodgers put in a waiver claim on Harper. Per SiriusXM radio host Craig Mish, the Chicago Cubs were awarded the claim on Murphy. The Athletic's Robert Murray reported the Cubs reached a deal to acquire the three-time All-Star. Jon Heyman of FanCred reported the Nationals will receive minor league second baseman Andruw Monasterio and cash or a player to be named later from the Cubs for Murphy. Per Yahoo Sports' Jeff Passan, Adams is being traded to the St. Louis Cardinals. Heyman added the Nationals will receive cash considerations. Harper is the biggest name on the Nationals and was the subject of trade rumors prior to the July 31 non-waiver deadline before general manager Mike Rizzo said the 2015 National League MVP wouldn't be moved. "Bryce is not going anywhere," Rizzo told Janes. "I believe in this team." The Nationals have gone 9-10 since the start of August and are 6.5 games out of a playoff spot in the NL. Harper, Murphy and Adams are among the Washington players eligible for free agency after this season, so a potential trade would allow the team to add future assets instead of possibly losing all three for draft-pick compensation in 2019. Named an All-Star for the sixth time in his career this season, Harper is hitting .246/.380/.511 with 30 home runs. Murphy has reached his stride with a .300/.341/.442 slash line in just 56 games after offseason knee surgery kept him out until June 12. The Cubs don't necessarily have an opening at second base with Javier Baez having his best season, but he has the ability to slide over to third base. Kris Bryant has been out since July 23 with a shoulder injury, but is expected to face live pitching this week as part of his effort to come back. Adams is slugging .510 with 18 homers in 94 games. He has spent time in left field and right field this season. The Cardinals are currently playing without Dexter Fowler, who is on the disabled list was is hitting just .180/.278/.298 in 90 games. Adams can serve as a platoon hitter since his OPS against right-handed pitching (.882) is significantly higher than it is against lefties (.608). MLB's waiver wire works in reverse order with first priority going to teams in the same league. Since the Nationals are in the NL, those teams would have first chance to put in a claim before anyone in the American League.